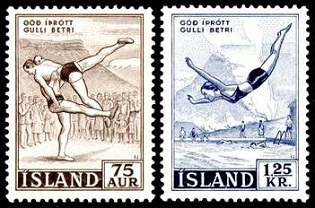 The two pictorial Iceland stamps shown above (Sc. 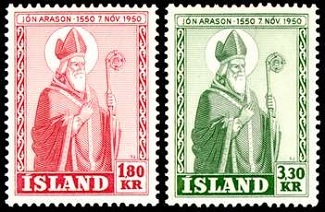 #269-270) were issued on November 7, 1950 to commemorate the 400th Anniversary of the Death of Bishop Jon Arason. Jon Arason (1784-1550) was an Icelandic Roman Catholic bishop who was executed for his struggle against the imposition of the Protestant Reformation in Iceland. The two pictorial stamps of Iceland shown above (Sc. #271-272) were issued on May 13, 1951 to celebrate the 175th Anniversary of the Iceland's Postal Service. The two designs represent surface-mail delivery and airmail delivery. The four commemorative stamps of Iceland shown above (Sc. 274-277) were issued on September 1, 1952 to honor Sveinn Bjornsson, the first president of the Republic of Iceland. Sveinn Bjornsson (1881-1952), a lawyer, businessman, and politician, had quite a public career. Between 1912 and 1952, he was a Reykjavik City Councilman (1912-1920), a Representative to the Althing (1914-1920), the Minister to Denmark (1920-1940), Regent (King) of Iceland (1941-1943) during the Nazi occupation of Denmark, and the first President of the Republic of Iceland (1944-1952). Sveinn died in Reykjavik in January 1952, during his third term in office. 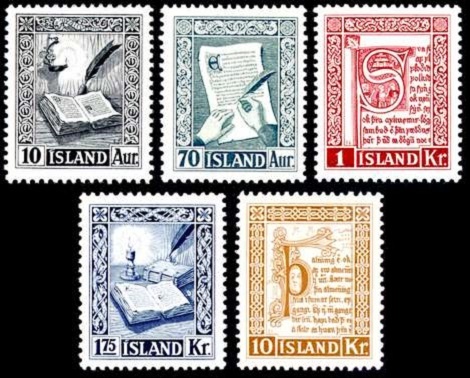 The five pictorial Iceland stamps shown above (Sc. #278-282) were issued on October 1, 1953. They feature Classic Icelandic Manuscripts. 10 A. - Reykjabok (c. 1300), one of the manuscripts of the 13th Century Njals Saga. 70 A. - Lettering a manuscript. 01 K. - Corner of a 15th Century manuscript. 01.75 K. - Reykjabok (c. 1300), one of the manuscripts of the 13th Century Njals Saga..
10 K. - Corner of a classical law manuscript. 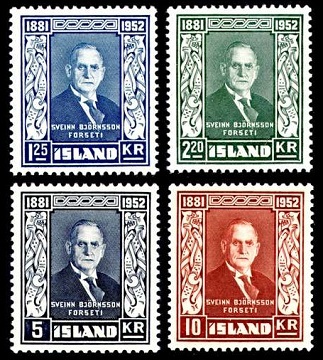 The three portrait stamps of Iceland shown above (Sc. #284-286) were issued on June 1, 1954 to commemorate the 50th Anniversary of the Appointment of the First Native Minister (Hannes Hafstein) to Denmark. Hannes Hafstein (1861-1922) was an Icelandic politician and poet. In 1904, he became the first Icelander to be appointed to the Danish Cabinet, as the Minister for Iceland. The two pictorial stamps of Iceland shown above (Sc. #287-288) were issued on August 9, 1955. They feature Icelandic Sports. The two designs feature wrestling and diving. The 35 A. denomination commemorative Mt. Hekla Eruption stamp shown above was overprinted and revalued to a 5 A. postage stamp (Sc. #283) on March 31, 1954.